The second half of my ‘reading for pleasure’ list of 2017. Detective fiction, and particularly, historical detective fiction is a guilty pleasure of mine – I blame discovering Sherlock Holmes in my early years, as well as Sexton Blake and Jack Tarling (Wallace), though since then I have devoured stories of William of Baskerville (Eco), Matthew Shardlake (Sansom) and Giordano Bruno (Parris). Yes, all men – I must discover some female sleuths other than the obvious one, but this year I found two new pairings of detectives. 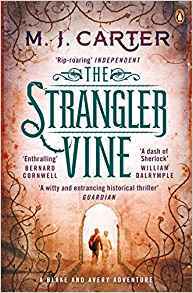 M.J.Carter’s Jeremiah Blake & William Avery series begins with The Strangler Vine in India during the period just before the East India Company ceded control to the British government. The intrepid pair are sent on a Company mission to Thuggee country to find a missing writer, but there are darker motives in play. The depiction of an expatriate society moving from initial engagement with India, via trade, curiosity and some mutual respect into brutish colonial exploitation is done well and the mystery keeps one reading until the very end. We next meet our heroes in London in The Printer’s Coffin, a London of Chartism, potential revolution and repressive reaction, in a bloody mystery with its roots in madness. Most recently our sleuths ventured into the well padded world of London’s finest clubs, this time with a brief to discover a poisoner in The Devil’s Feast. As with each tale, the historical background is intriguing – I learned much about the, real, Alexis Soyer and his innovations in cuisine – as well as the clubland rivalries of the time. My other ‘new’ old detectives are Coroner Titus Cragg & M.D. Luke Fidelis in Robin Blake’s 18th century Preston. 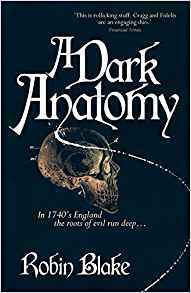 Beginning with A Dark Anatomy, our intellectually curious pair (they are less physically intrepid than Blake and Avery, but possibly more engaged with new ideas and science) tackle mysterious deaths, murky dealings and superstition in world where policing is almost feudal and forensic science in its infancy. Each story begins with a death – an obvious murder, a supposed accidental demise, a would-be suicide or the killing of a new born – and the Coroner’s involvement, but rarely is everything as it seems. Blake explores the undercurrents in a provincial Georgian town, through Dark Waters, The Scrivener and, the latest to date, Skin and Bone. Some non-fiction which I read and can recommend includes Lonely Courage by Rick Stroud, a remarkable book about the women who were parachuted into occupied France during WWII and who faced danger, torture and death. Their stories and courage defy belief. It is good to see that, finally, some of them have finally been recognised as the heroines they truly were. While Nancy Wake and Virginia Hall (a New Zealander and American respectively) received honours post war, others were less fortunate. Noor Khan’s statue was unveiled in Gordon Square Gardens in 2012. 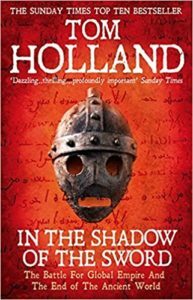 Given my interest in Al Andalus, how could I not have read Tom Holland’s In the Shadow of the Sword until 2017? It has been sitting on my bookshelf since the paperback was published in 2013. With the narrative drive and story-telling aplomb of his earlier books, Rubicon and Persian Fire, (which were very hard to put down, see History Writing ) this book tackles a subject both more complex and more incendiary. It is about the formation, from the ashes of Christian Rome and Zoroastrian Persia, of the Arab and, indeed, the Muslim empire. Just as with the early years of Christianity, the received canon as regards the creation of Islam is challenged. 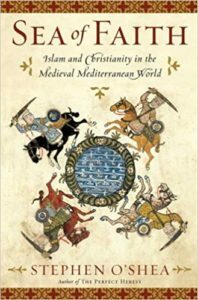 Holland is good on the three great monotheisms and their co-existence and rivalry, covering some of the same ground as Sea of Faith, Stephen O’Shea’s excellent telling of the history of the Mediterranean through the conflicts between the three faiths. Not the only books I have read in 2017, of course, just the ones which spring to mind as recommendations. I look forward to 2018 and more reading.